Recently one evening at home I sat down to watch a movie. After a while I became uncomfortably aware of how hard I found it to just sit and watch the film, without checking my phone for texts or popping on Facebook. This I must confess was something of a shock and embarrassment as I have been practicing and teaching meditation for over 20 years and spend my time encouraging people to explore being more mindful. I then began to reflect on my experience of restlessness during the film. Was I drawn away from the film because I had easy access to my mobile phone and lap-top, or was the restlessness within me? It was probably a combination of both those and maybe other factors. I found his response interesting. He had healthy created boundaries for his children so that they did not spend all their time on the internet or playing games on their phone or computer. Speaking to friends who are parents they tell me that they try to do the same. I am beginning to wonder whether we as adults need to do this for ourselves? Speaking as someone who is a self-employed yoga teacher, it is not always easy to establish a clear line between working and resting. As wonderful as modern technology is (and I am a man who loves his Ipod) it is very easy to slip into a habit of spending your evenings responding to emails. I have made a little promise to myself that I am going to switch off my lap-top and phone in the evening and try and just be open and present to my experience. 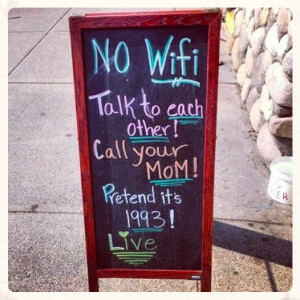 I am not advocating that we should throw our technological devices away, but maybe next time we reach for our mobile, we could try leaving our phone in our pocket and just be with life, as it is. The world is not going to collapse because you have missed a Facebook update. Maybe if we were not so busy trying to communicate via social media, we could stop, look and maybe talk to the person sitting next to us?